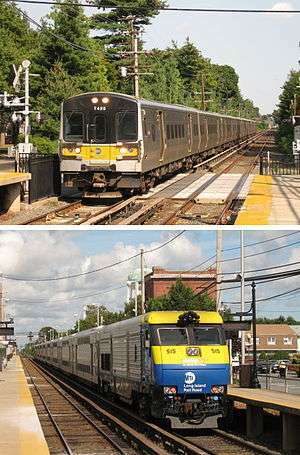 The Long Island Rail Road operates electric and diesel service into New York City along with Metro-North Railroad and NJ Transit Rail. 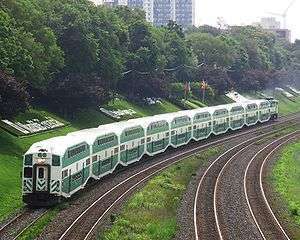 A GO Transit train on the Lakeshore West line in Toronto, Canada. Commuter rail, also called suburban rail, is a passenger rail transport service that primarily operates between a city centre, and the middle to outer suburbs beyond 15 km (10 miles) and commuter towns or other locations that draw large numbers of commuters—people who travel on a daily basis. Trains operate following a schedule, at speeds varying from 50 to 200 km/h (30 to 125 mph). Distance charges or zone pricing may be used. 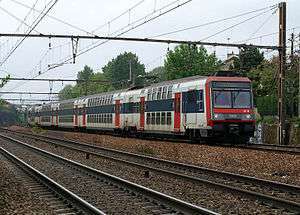 Non-English names include Treno suburbano in Italian, Cercanías in Spanish, Rodalies in Catalan, Proastiakos in Greek, S-Bahn in German (although Regionalbahn or stopping services occasionally also operate as commuter trains), Train de banlieue in French, Příměstský vlak or Esko in Czech, Elektrichka in Russian, Pociąg podmiejski in Polish and Pendeltåg in Swedish. The development of commuter rail services has become popular today, with the increased public awareness of congestion, dependence on fossil fuels, and other environmental issues, as well as the rising costs of owning, operating and parking automobiles. The general range of commuter trains' distance varies between 15 and 200 km (10 and 125 miles). Sometimes long distances can be explained by that the train runs between two or several cities (e.g. S-Bahn in the Ruhr area of Germany). Distances between stations may vary, but are usually much longer than those of urban rail systems. In city centers the train either has a terminal station or passes through the city centre with notably fewer station stops than those of urban rail systems. Toilets are often available on board trains and in stations. Most such trains run on the local standard gauge track. Some light rail systems may run on a narrower gauge. Examples of narrow gauge systems are found in Japan, Indonesia, Switzerland, in the Brisbane (Queensland Rail's City network) and Perth (Transperth) systems in Australia, in some commuter rail systems in Sweden, and on the Genoa-Casella line in Italy. Some countries, including Finland, India, Pakistan, Russia, Brazil and Sri Lanka, as well as San Francisco (BART) in the USA and Melbourne and Adelaide in Australia, use broad gauge track. However, the classification as a metro or rapid rail can be difficult as both may typically cover a metropolitan area exclusively, run on separate tracks in the centre, and often feature purpose-built rolling stock. The fact that the terminology is not standardised across countries (even across English-speaking countries) further complicates matters. This distinction is most easily made when there are two (or more) systems such as New York's subway and the LIRR, Metro-North along with PATH, Paris' Métro and RER along with Transilien, London's tube lines of the Underground and the Overground, (future) Crossrail, Thameslink along with other commuter rail operators, Madrid's Metro and Cercanías, Barcelona's Metro and Rodalies, and Tokyo's subway and the JR lines along with various privately owned and operated commuter rail systems. In Germany the S-Bahn is considered as a train category of its own, and exists in many of the large cities and in some other areas but do have differing service and technical standards from city to city. Most S-bahns typically behave like commuter rail with most trackage not separated from other trains, and long lines with trains running between cities and suburbs rather than within a city. The distances between stations however, are usually short. In larger systems there is usually a high frequency metro-like central corridor in the city center where all the lines converge into. Typical examples of large city S-Bahns include Munich and Frankfurt. S-Bahns do also exist in some mid-size cities like Rostock and Magdeburg but behave more like typical commuter rail with lower frequencies and very little exclusive trackage. In Berlin, the S-Bahn systems arguably fulfill all considerations of a true metro system (despite the existence of U-Bahns as well) – the trains run on tracks that are entirely separated from other trains, short distances between stations, high frequency and uses tunnels but do run a bit further out from the city centre, compared with U-Bahn. A similar network exists in Copenhagen called the S-tog. (where a metro system also exists). In Hamburg and Copenhagen, other, diesel driven trains, do continue where the S-Bahn ends ("A-Bahn" in Hamburg area, and "L-tog" in Copenhagen). Sometimes high-speed rail can serve daily use of commuters. The Japanese Shinkansen high speed rail system is heavily used by commuters in the Greater Tokyo Area. They commute between 100 and 200 km by Shinkansen. To meet the demand of commuters, JR sells commuter discount passes and operates 16-car bilevel E4 Series Shinkansen trains at rush hour, providing a capacity of 1,600 seats. Several lines in China such as the Beijing–Tianjin Intercity Railway, and the Shanghai–Nanjing High-Speed Railway, serve a similar role with many more under construction or planned. The high-speed services linking Zürich, Bern and Basel in Switzerland (200 km/h (120 mph)) have brought the Central Business Districts (CBDs) of these three cities within 1 hour of each other. This has resulted in unexpectedly high demand for new commuter trips between the three cities and a corresponding increase in suburban rail passengers accessing the high-speed services at the main city-centre stations (or Hauptbahnhof). A Metrorail train pulling out of Kalk Bay station in Cape Town. Currently there are not many examples of commuter rail in Africa. Metrorail operates in the major cities of South Africa, and there are some commuter rail services in Algeria, Kenya, Morocco, Alexandria, Egypt and Tunisia. In Algeria, SNTF operates commuter-rail lines between the capital Algiers and its southern and eastern suburbs. They also serve to connect Algiers' main universities to each other. The Dar es Salaam commuter rail offers intracity services in Dar es Salaam, Tanzania. Yamanote Line which is representative of the Japanese commuter rail. In Japan, commuter rail systems have extensive network and frequent service, and are heavily used. In many cases, Japanese commuter rail is operationally more like a typical metro system (with very high operating frequencies, an emphasis on standing passengers, short station spacing) than it is like commuter rail in other countries. Japanese commuter rail also tends to be heavily interlined with subway lines, with commuter rail trains continuing into the subway network, and then out onto different commuter rail systems on the other side of the city. Many Japanese commuter systems operate several levels of express trains to reduce the travel time to distant locations, often using station bypass tracks instead of dedicated express tracks. It is notable that the larger Japanese commuter rail systems are owned and operated by for-profit private railway companies, without public subsidy. Commuter trains are somewhat uncommon in China, although systems have been inaugurated in several cities such as Beijing, Shanghai, Zhengzhou, Wuhan and the entire Pearl River Delta. The level of service varies considerably from line to line ranging high to near high speeds. More developed and established lines such as the Guangshen Railway have more metro-like service. Hong Kong MTR's East Rail Line and West Rail Line were built to commuter rail standards but are operated as a metro system. In Indonesia, the KA Commuter Jabodetabek is the largest commuter rail system in the country, serving Jakarta metropolitan area. It connects Jakarta city center with surrounding cities and sub-urbans in Banten and West Java provinces, including Depok, Bogor, Tangerang, Bekasi, Serpong and Maja. In July 2015, KA Commuter Jabodetabek served more than 850,000 passengers per day, which is almost triple of the 2011 figures, but still less than 3.5% of all Jabodetabek commutes. Other examples include KTM Komuter in Malaysia, and the Philippine National Railways orange line in Metro Manila, Philippines. In India, commuter rail systems are present in major cities. Mumbai Suburban Railway, the oldest suburban rail system in Asia, carries more than 7.24 million commuters on a daily basis which constitutes more than half of the total daily passenger capacity of the Indian Railways itself. The Chennai Suburban Railway along with MRTS is another railway of comparison where more than 1 million people travel daily to different areas in Chennai. In Hyderabad, the MMTS mainly transports people from the city centre to HI-TEC city, the city's Information Technology hub. Other commuter railways in India include Kolkata Suburban Railway which is the biggest Suburban Railway network in India covering 348 stations, Delhi Suburban Railway, Pune Suburban Railway and Lucknow-Kanpur Suburban Railway. In Iran, SYSTRA has done a "Tehran long term urban rail study". SYSTRA proposed 4 express lines which are similar to RER suburban lines in Paris. Tehran Metro is going to construct express lines. For instance, the Rahyab Behineh, a consultant for Tehran Metro, is studying Tehran Express Line 2. Tehran Metro currently has a commuter line between Tehran and Karaj. Esfahan has two lines to its suburbs Baharestan and Fuladshahr under construction, and a third line to Shahinshahr is planned. Major metropolitan areas in most European countries are usually served by extensive commuter/suburban rail systems. 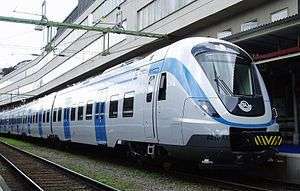 Well-known examples include Beovoz in Belgrade (Serbia), S-Bahn in Germany and German-speaking areas of Switzerland and Austria, Proastiakos in Greece, RER in France and Belgium, suburban lines in Milan (Italy), Cercanías in Spain, CP Urban Services in Portugal, Esko in Prague and Ostrava (Czech Republic), HÉV in Budapest (Hungary) and DART in Dublin (Ireland). 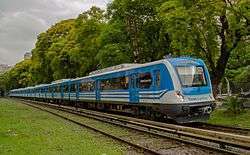 In Poland, commuter rail systems exist in Tricity, Warsaw, Cracow and Katowice urban area. There is also a similar system planned in Wrocław. Metrolink provides commuter rail service to 6 counties in Southern California. Examples include an 899 km (559 mi) commuter system in the Buenos Aires metropolitan area, the 225 km (140 mi) long Supervia in Rio de Janeiro, and the Metrotrén in Santiago, Chile. Another example is Companhia Paulista de Trens Metropolitanos (CPTM) in Greater São Paulo, Brazil. CPTM has 93 stations with six lines, numbered starting on 7 (the lines 1 to 6 belong to the São Paulo Metro), with a total length of 260.8 kilometres (162.1 mi). 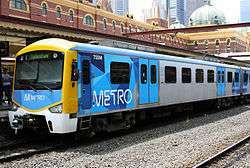 Major cities in Australia have suburban railway systems in their metropolitan areas. As with Japanese suburban railways or Germany's and Switzerland's S-Bahns, these Australian networks have far more frequent services and far higher ridership per capita than US 'commuter rail' in the usual sense of the term. To some US observers these networks may appear to operate as commuter/metro hybrids, however, they are simply the result of full utilisation of the available track capacity in the core of the suburban rail network, this being fed from multiple feeder lines. This is particularly so in Sydney and Melbourne, where headways on many lines in the core of the network reach 3–5 minutes in peaks and 10–20 minutes off peak (about 18 hours a day) and enter an underground loop for passenger distribution in the city centre; and where ridership per capita exceeds the sum of metro and commuter rail in comparable North American urban areas such as Toronto, Boston or the San Francisco Bay Area. All systems, however, are based on established main line rail systems, and track sharing with inter-city and freight services on parts of the network inhibit higher frequencies on some tracks. 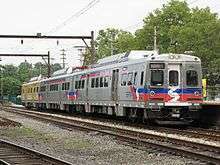 They are sometimes erroneously referred to as heavy rail, a different mode of public transport. Adelaide suburban railway in Adelaide. 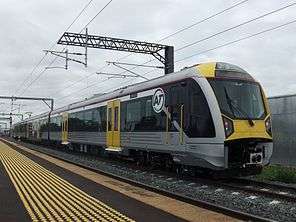 New Zealand has two commuter rail systems, one using 25,000 V AC in Auckland and the other one using 1,500 V DC in Wellington (formerly operaterd by Tranz Metro). ↑ "PT KCJ: Keterlambatan KRL Sudah di Bawah 10 Menit". July 6, 2015.